A Living Treasure: Thirty Years of Anthony Zepeda and the ArtCenter Printmaking Studio is an exhibition that pays tribute to legendary teacher and printmaker Anthony “Tony” Zepeda. In 1975 Zepeda began his career at Gemini G.E.L printing studio where, for the next 11 years, he created works for artists such as David Hockney, Jasper Johns and Roy Lichtenstein. 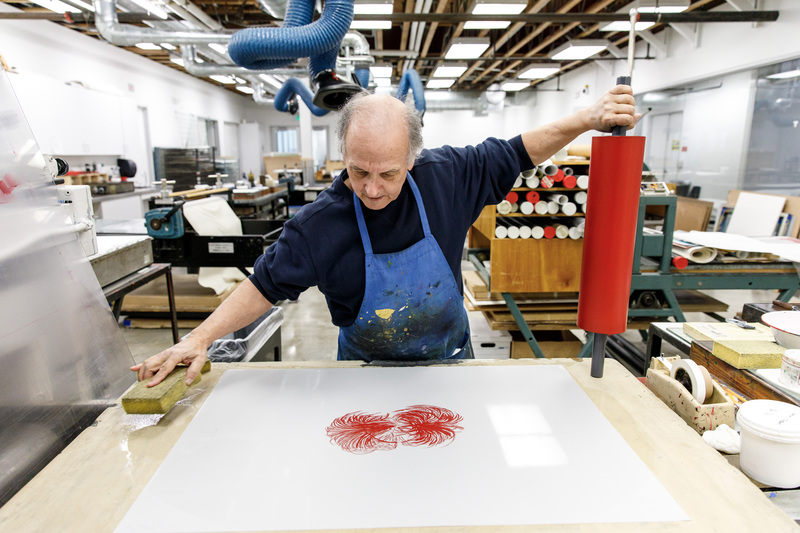 In 1986, Zepeda left Gemini to establish the ArtCenter Print Shop where he inspired and influenced the work of students who went on to become artists recognized as leaders in their fields. The exhibition opens Tuesday, January 23, 2018 at the Hutto-Patterson Exhibition Hall, 870 South Raymond and continues through August 20, 2018. The opening reception on Tuesday, January 23, from 7:30 to 9 p.m. is free and open to the public. A Living Treasure is co-curated by Tom Knechtel, chair, undergraduate Fine Art, and David Tillinghast, associate professor and director of Special Projects, Illustration. The exhibition features works by alumni artists and illustrators including Gregory Chapuisat, Josh Cochran, David Jien, Alex Kroll, Lisa Madonna, Mehregen Meysami, Paige Jiyoung Moon and Ryan Perez. “We are very proud of the work Tony has done with our students, and we invite you to savor this wonderful banquet of imaginative, gorgeous work that has emerged from the ArtCenter Print Shop under the guidance of Tony Zepeda, master printer and teacher,” said Knechtel and Ann Field, chair, Illustration. Known as wildly entertaining, Zepeda has a storied past, working at Gemini G.E.L. with acclaimed artists such as Johns and Robert Rauschenberg. Then Fine Art Department Chair Laurence Dreiband invited Zepeda to create a print shop at ArtCenter in 1986. Zepeda’s stewardship of the print shop and his teaching have become the stuff of legend among students. Alumni speak fondly about how he influenced the way they saw themselves and their work. Current students tell stories about Zepeda as a stern taskmaster, who then pulls a student aside who is looking a little famished, gives them $20 and tells them to go get lunch. He is famous for staying late and on weekends to help students with their projects, for encouraging them to take risks and to try something new. This show speaks volumes about that encouragement and inspiration of Zepeda during his more than 30 years on campus. In this show, visitors will see etching (hard and soft ground), drypoint, lithography, silk screen, cyanotype, salt prints and platinum prints, woodblock and wood engravings. The aesthetic range is even wider, from the most delicate figuration to raw expressive work, from abstract images to conceptually-based approaches. The work in the show comes from people now recognized as leaders in their fields who once were students in the print shop, encouraged by Zepeda to produce work that is true to their vision, and, at the same time, embedded in the multiple possibilities of printmaking technologies. This goes to the heart of the work at ArtCenter: to engage deeply with craft while learning to take creative risks and speak with your own voice. A print fair and sale will take place on Saturday, March 24, 2018.